It's not cheating ... it's just Nerd Rage for locks. 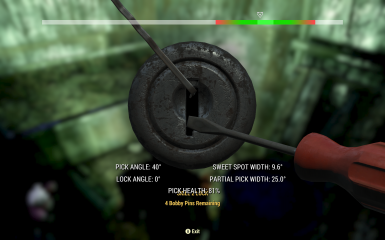 As far as I know, no one was ever banned for using the original lock picking mod. That one still works but the backend has gotten a bit out of step with the rest of the game, so I figured I'd give it a quick refresh. This version is based on Patch 8 (updated 3/30). For increased immersion, the overlay only triggers when you're down to your last pick. It's not cheating ... it's just Nerd Rage for locks.